If you have just set foot on Nippon terra-firma, chances are you’re standing in one of two Tokyo airports; Narita or Haneda. These airports are the main gateway between all that is deep and powdery in Japan, and the outside world. From here your next course of action is either to transfer to the domestic boarding area and enjoy a short flight North for some world-class Ja-pow, or to start wandering around the terminal trying to Google Translate your way into Tokyo city. If the latter fits you then we’ve got you covered with our official Novice’s Guide To Accessing Tokyo. First things first, will you be returning to the airport after visiting Tokyo? If the answer is YES then you don’t want to be dragging a 2m long board bag, 65L hiking pack, guitar case, and whichever extra packs and cases your spouse has laden upon you, around the streets and train stations of central Tokyo – check all of your unwieldy items into the nearest Airport Luggage Storage. The following locations have affordable prices and open early which is great for those catching an early flight the next day. On the B1 floor of Terminal 1 and 2, you can find storage counters – look for a sign with the following kanji: 手荷物預り所. An alternative solution for reducing your luggage load is to use the extra convenient TA-Q-BIN service – popularly known as “black cat” due to the distinctive logo; suitcases and other cumbersome items can be sent from the airport directly to your accommodation using the same GPA service counters for storage without any booking process required. Expect a 2 day delivery time for far north locations such as Niseko. More information on baggage delivery can be found here. Now that you’ve lightened your load it’s time to find your way to the bright lights and endless culinary delights of the big city! 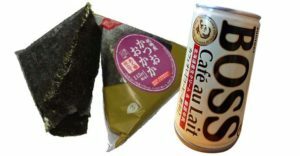 The salaryman’s bento… onigiri and coffee in a can. 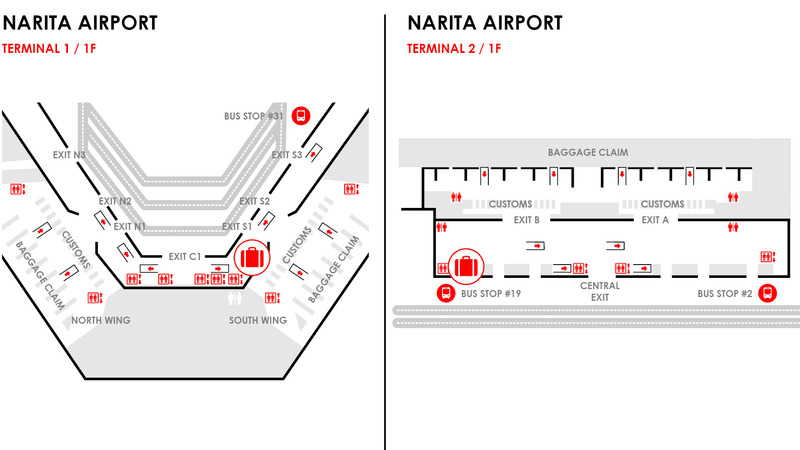 Bus – The Access Narita departs from all three Narita Airport terminals; Bus Stop #31 at Terminal One, #2 and #19 at Terminal Two, and #2 and Terminal Three. Pay the fare to the driver directly as you board (1,000JPY). If the passenger line-up is long you may have to wait for the next bus but with only approx. 20 mins between each departure this is a convenient method to travel to Tokyo Station. Travel time approx. 70mins. Train – The Keisei Skyliner is the fastest route, at only 40mins travel time it provides a smooth, comfortable ride to Ueno Station for 2,470JPY. 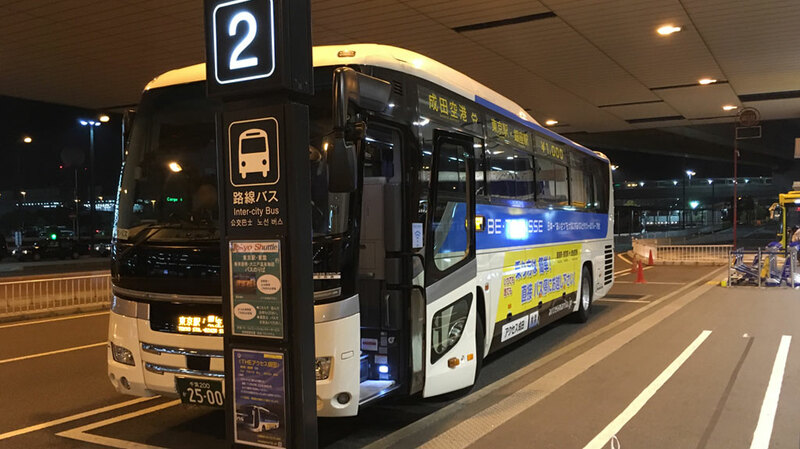 Alternatively, the N’EX is another comfortable option which offers a discount to all foreign passport holders: 4,000JPY for a round-trip (handy if you want to return to the airport using the same line). Follow the signs down to the B1 floor of Terminal 2 for all train ticketing machines and service counters. Have your passport ready to show at the counter for N’EX line. Bus – Bus tickets can be purchased from the Ticketing and Sales counter on the left after exiting immigration, or at the ticket machines located in the bus stop area on the first floor. Tickets to Tokyo Station are 930JPY and travel time is approx. one hour. Train – The Tokyo Monorail takes only 15 minutes and will transport you from any Haneda Terminal through to Hamamatsucho Station for only 490JPY. From here you can transfer to the Yamanote line circuit (colour coded light green at all connecting stations) for easy access to Shinjuku, Shibuya, Harajuku and Tokyo Station. 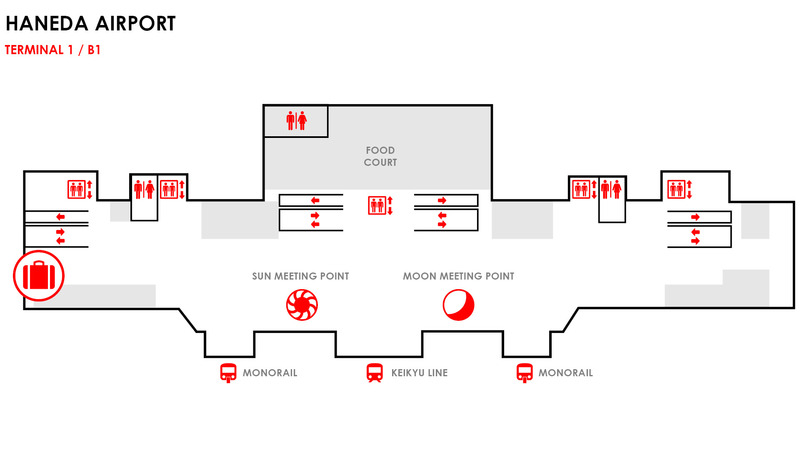 – Google Maps is your best friend when navigating the Tokyo JR (Japan Rail) and Metro lines, providing full English connection options and fares between any two given stations. – If you don’t have internet access or you’re struggling to work out how much your JR or Metro train ticket will cost, just purchase the cheapest ticket (usually 140JPY) then when you arrive, look for the FARE ADJUSTMENT machine before going through the gate at your destination. This machine will calculate the correct fare and update your ticket. – Consider investing in a prepaid Suica card for 500JPY from the JR ticket machines to avoid purchasing paper tickets at each stop. These Train passes can be preloaded with money for easy scan-entry to train stations throughout Japan. A great how-to on purchasing your own Suica can be found here. Options for an overnight stay in Tokyo are plentiful, but since we’re only here for 24 hours let’s make it count! A run-of-the-mill business room is the most common result found on Google, but at around 10,000JPY per night, walking into a room where three sides of the bed touch a wall and the faint smell of stale cigarettes permeates the cell-like confines, this isn’t the most culturally stimulating option. Left: self-service check-in screen at typical Love Hotel. Right: Inside look at a capsule. If you’re travelling alone or with a couple of friends, a capsule hotel is a must-try experience. Usually priced between 2,500JPY and 5,000JPY, each dormitory is lined with dozens of 1m x 1m entrances – one row along the floor and another stacked on top. Inside is a futuristic sleeping space about 2m deep containing a single bed and a control panel packed with all sorts of knobs and buttons for controlling personal lighting, as well as a built-in TV. Great if you like cosy hidey-holes… not so great if you’re claustrophobic or perturbed by the thought of your feet being separated from dozens of snoring strangers by nothing more than a roll-down canvas screen. For couples, an adventurous route to take is to experience the world-famous Love Hotels of Japan! 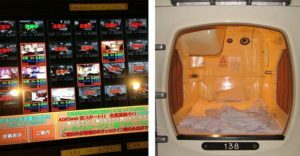 Most larger stations have a dedicated Love Hotel District with plenty of options ranging from genuinely squalid and disreputable, to outrageously opulent. Most Love hotels feature prominent signage at the entrance displaying rates in English along with photos of the different room types. As a general rule; 7,000JPY is a good starting point to get you and your significant other a comfortable room for the night which will rival most regular hotel rooms in price, size, and amenities. Expect oversized beds, jacuzzi baths, in-room karaoke and mirrored ceilings. Love Hotels can’t be pre-booked, and overnight stays are only permitted after 10pm, making these a better choice for those planning a late night out – as such it’s important to bear in mind that there may be limited vacancies during weekends and holidays. Note that many love hotels don’t have a check-in counter; instead, search the lobby for a screen displaying all the room types – this is the interface for discreet bookings – no talking with check-in staff required! For larger groups or those carrying lots of luggage, booking a hotel or AirBnB in advance is a good idea – especially if there are plans to split up during the day, providing everyone with a base of operations to return to. As a general rule, the further from central locations such as Shinjuku, Shibuya, and Roppongi you are, and the further your walk to the nearest station, the cheaper the nightly rates. Sometimes just 5-10 minutes of extra walking can be the difference between a cheap sleep and reaching deep into the pockets. Now that you know how to get into Tokyo and where to stay, it’s time to think about how to spend your time there! Check out our 8 Things To Do In Tokyo guide for suggestions.